So I’ve done some fag packet calculations this evening because I’m so increasingly concerned about the financial welfare of my students. When I was at the 2014 Open Ed Conference in Washington and first started hearing about open textbooks, I conducted a very quick and dirty survey with some of my students. I realised I had no idea about their textbook purchasing habits, or indeed, how this fitted into the wider context of their university experience. I really should write that up. There were 69 responses from science students. Nearly 80% had part time jobs. They on average spent (based on their estimations) between £300 and almost £1000 on text books. What about our textbook recommendations? Clearly our degree programmes are structured around credit-bearing modules, and it is a requirement of validation and professional body accreditation to make recommended reading lists. This can comprise books that are strongly recommended to accompany each module, plus those that provide supplementary reading. Of course, every book recommended is available in the library. But what if someone really did come along and buy – even some of them? And as academic teams, do we ever sit back and think of the prices of those books we are recommending? What I’ve done is compiled the reading lists of all the compulsory modules for our Biomedical Science degree. This degree is offered at 91 universities across the UK, and I am pretty confident that their lists will look the same. This excludes similar courses – clinical sciences, medical sciences. Let’s just stick with Biomedical Science for now. Students have 4 compulsory year 1 modules, 3 in year 2 and select 3 in year 3. These estimates assume a student will by a text relating to each important area, so there may be more than one strongly recommended text for some modules. I’ve also not accounted for one or two modules where the books from the first year will do for modules later on. So to purchase a good range of books that = 33 texts. For year 1 that = 10 texts. 7 books are priced way over £100. Kindle versions are really no cheaper. So this already sounds ludicrous, but it is what we recommend. So why do we recommend and advise on books in this way? This was the Amazon price of the most expensive book recommended. My prices were based on Hardback cover, Paperback or Kindle versions, and I took the most expensive price on offer which may be through Amazon or a private provider. Of course there are second hand versions available, but unfortunately for science, go back more than one edition, and it will be generally out of date. If all the students enrolled onto these modules purchased all of the books, the grand total is £289,710. The largest first year module has over 200 students and the most expensive book there is £184.99 for a hardback version of a core physiology text. In fact this was the text I purchased in my degree, so possibly a good investment over the years although mine is certainly 20+ years out of date. I certainly would look round for a previous edition, paperback version instead, but for a chunky core book, you’d still be talking around £50. The thing that worries me most about education is the vast amount of duplication of lecture and content creation, that teaching resources are discarded when people leave or retire, and I’ve written about this before. Of course, any excuse to share Kevin Mear’s excellent cartoon capture of mine and David’s session “the cost of not going open“. The cost of not going open is also unfathomable for students across the nation. Multiply up the cost of Biomedical Science textbooks from one university to the other 91 that offer the same course, and yes, that is the figure in the millions. But what about some real numbers? In my 2014 textbook survey, students claimed an average spend between £300-1000. Huffington post article showed how costs had risen by over 800% over the last three decades in College Textbook Prices Increasing Faster Than Tuition And Inflation. Figures in the article are similar to my fag-packet ones, with students on average spending about $655 on textbooks, with the most expensive being around $300. In the 2010 National Union of Students (NUS) report What are the Costs of Study and Living, over £1000 was attributed to books and additional equipment. Further NUS reports like Debt in the First Degree detail the financial burden that students experience, and how it leads to many holding down jobs whilst studying. And we often wonder why they don’t attend classes? What is the progression and success rate for those students who have to work? What is the impact financially of those who for whatever reason have to drop out, or delay a year because work has impacted on their study? Anyway, this isn’t intended as an in-depth academic study of the area. But we absolutely need to do just that! We also need to be providing flexible study choices for students and think about the sustainability and cost-effectiveness of the education systems we offer. Open education! Open education? Open. Education. UNESCO (2016) believes that universal access to high quality education is key to the building of peace, sustainable social and economic development, and intercultural dialogue. Open Educational Resources (OER) provide a strategic opportunity to improve the quality of education as well as facilitate policy dialogue, knowledge sharing and capacity building. The Cape Town Declaration (2007) (supported by Open Society Institute (OSI) and the Shuttleworth Foundation) stated…we are on the cusp of a global revolution in teaching and learning. Educators worldwide are developing a vast pool of educational resources on the Internet, open and free for all to use. These educators are creating a world where each and every person on earth can access and contribute to the sum of all human knowledge. They are also planting the seeds of a new pedagogy where educators and learners create, shape and evolve knowledge together, deepening their skills and understanding as they go. I do love the global open education community because it gave me a home where my ideas for education could be firmly routed. I have shared open educational resources (OER) for over ten years. The aspirations above have inspired me, my colleagues and my students. But you know what, unless we actually evaluate these objectives, we will never know what we have actually achieved!!! So come one, we all need to wake up to the idea of sharing our research strategies to carry out some good evaluations of where we are. (And if you don’t know about Blake 7. You should. And goodbye for the next few hours, days or weeks –https://youtu.be/NWv2WWNZzhw). I know research takes a huge amount of time and effort. But couldn’t we sneak just one or two little questions in, really? “UNIVERSITY STUDENTS AND FACULTY HAVE POSITIVE PERCEPTIONS OF OPEN/ALTERNATIVE RESOURCES AND THEIR UTILIZATION IN A TEXTBOOK REPLACEMENT INITIATIVE”, in Research in Learning Technology. 524 students were surveyed and 13 faculty teachers were interviewed regarding the adoption of open books on a range of biology and maths subjects. That is a considerable chunk of work. Students were kinda satisfied. There again, if you ask students anything, they are generally kinda satisfied. But what about those who might not have afforded education in the first place, or those who learn in different ways? Did using open textbooks transform their experiences, because I’d really love to know. I loved the faculty (teaching staff) responses – generally finding the adoption and repurposing of textbooks rather difficult but absolutely rating their experience with this open text book initiative as very strong. This study is super as it gets beneath the surface, and the open questions and answers start to reveal the benefits of open texts in that they are more up to date and customisable. Student responses to the use of an open textbook were firstly financial, they supported the idea and they liked having an online book. But as Peggy Lee once sang, “Is that all there is”? “Then let’s keep dancing”. Olga Belikov (2016), Brigham Young University. “INCENTIVES AND BARRIERS TO OER ADOPTION: A QUALITATIVE ANALYSIS OF FACULTY PERCEPTIONS”, in Open Praxis. Another paper just out, is on 218 faculty (teacher) responses as part of the 2014 ‘Babson’ survey. Staff were asked about their perceptions of OER and were invited to leave an ‘open’ response at the end of the survey. The top three barriers were – need more information, lack of discoverability and confusing OER with other digital resources. In terms of positive responses, the top response was a generally positive idea that this is “the way of the future”, that OER contributed to better student costs and equity of study, and that resources were equal to traditional materials. The open comments are as always very revealing, but I wonder if responses for a wider and more varied population (as part of a series of studies), would give rise to a broader framing of the barriers and incentives to using OER or open textbooks? And why not include some of the bigger ambitions of the OER community round diversity and opportunity? This study and many others is really interesting – around 10% of students have different learning needs, yet, this isn’t at the front of our minds. Barbara Stack Illowsky (2016), Foothill-De Anza Community College District (USA) and a multi-centre research collaboration. “EXAMINING STUDENT PERCEPTIONS OF AN OPEN STATISTICS BOOK”, in Open Praxis. This is a nicely conducted study that has asked students about their perceptions of cost and quality of open texts adopted for the teaching of statistics. 231 students completed the survey. The survey results were nice and gave a good glimpse into student textbook purchasing habits – something of which we know very little. Although the texts were offered for free online, some students liked a printed copy. The numbers of hours a week used was similar to other texts, and always rather disappointingly, in terms of quality, the majority saw the open text equal or better than the commercially available alternative. Only 13% saw it as worse. Either students have different understanding of the term ‘quality’ as we do, which I suspect, or the book was released in a similar format and didn’t intend to explore any more creative elements – collaboration, multimedia, links to further resources. It is interesting that students when offering feedback will often use words like “confusing” and not “comprehensive”. What does this really mean? When we questioned students about what they valued in terms of resources, they referred to ease of discovery, quick to use, and resources that didn’t require time and effort to understand. This might be quite different from the ambitions of faculty and teaching staff. “The book is written simply and clearly. This made it easy to understand and less ‘taxing’ to read. The collaborative aspect of the course built in the text encourages group learning which I have found to be beneficial to my learning.” (Illowsky paper). Does open education offer equal opportunities for all those who wish to learn and to reap the benefits that education can offer, or even a short course or forming a network can offer? Does open eduction address social inequality and other recognised inequalities within our education systems, such as in “Causes in differences of student outcomes“? Does open education offer a high quality education – linked to sustainability and peace? Are we really addressing access and accessibility? Evaluation is central to us all achieving these goals – I look to the US, Africa and elsewhere for evidence to present to decision makers in MY country. So go on, sling in a few interesting questions. If you don’t, Avon will come after you. CSF101 (session 1) – the inspiring challenge. CSF101 (session 2) – understanding systems. CSF101 (session 3) – how the earth works. OK. I’m on the home run with session 4. We are thinking about defining sustainability again, and Steven Henry in his opening video says part of the problem is we’ve put man at the centre of the problem. In reality, nature is at the centre of the problem and we are a component of that. Steve’s most important message to me is that this is where we’ve gone wrong by putting ourselves and our needs first, rather than thinking of ourselves as part of the system. We think about it in terms of achieving one big shiney goal. What we need to do is think about the sustainability of all the component parts, that then as a whole, can offer something of a viable future. I guess that is how the body works. Some body systems might be healthier than others – I wouldn’t want to vouch for my liver these days. But the sum of the parts, is still something that is overall healthy. I’ve a hernia and diverticulitis, but the systems are acting all around to create health. I’ve suggested this with sustaining open educational resources – bung them out on at least two platforms at a time, and when one dies, you can repopulate from the other. Steve suggests the most realistically accepted model is that on the right. Financial decisions drive all of our considerations. I think this absolutely must be part of the challenge – now that sustainability has become a business, approaches will be guided by those with a vested interest, and wrong choices might be being made by those clearly in for making a profit. Perhaps this is the sacrifice if we want to be making big changes, but are we really making big enough changes? A bit like open educational resources (OER) again. Nobody wants to pay for them, but if we all share the cost, then that is almost negligible. If we share our knowledge and outputs of our teaching as ‘part of what we do’, then that five minutes a week is negligible. The same with sustainability. As a society we all need to know what to do to ‘do our bit’. I hate sorting out the rubbish each week into elaborate piles for recycling. It couldn’t be more confusing. But if this is making a difference then it is essential. Do we just accept this model? Dr Robert (Founder of the Natural Step) talks about the ‘triple bottom line’ – that is, social, ecological and financial basis. The economics drives the approach, and is the means for everything else. The solutions are about the design of products and services. I have worked in a global blue-chip company. If we think businesses and business people will ALL share the same ethical values for the good of society and ecology, then I we will be very much disappointed. There are a number of genuinely ethical companies out there, but how can the economic goals place nature and society as a priority above profit? It won’t happen. Are pharmaceutical companies really concerned about curing disease? Are food manufacturers really concerned about our health? I’m not talking about individuals in those companies who will be highly motivated toward the common good, but the overall business objectives will be to make money. What is missing from the models above is an ethical or moral component. I also think tackling sustainability through business will never be big enough. We need each and every person on the planet to champion the cause. Manfred Max-Neef, Antonio Elizalde and Martin Hopenhayn have listed 9 basic human needs to survive and to integrate as a society: things like food/water, freedom, culture and education is in there. I do think though that some people are driven by the very need to make money, or to achieve positions of power. For the model to work, we’d have to integrate this also. More can be found on Wikipedia – fundamental human needs. The glue that sticks individuals together is the need for trust, that is how we form friendships, groups, communities and society. Sustainable development is the kind of development that meets the needs of the present without compromising the ability of future generations to meet their own needs. (Our Common Future, Report 1987). These can be applied to any situation to formulate a sustainability plan, so for education, well, let’s have a go. eliminate the use of precious resources – e.g. teaching materials that are not share, or work discarded from people who retire (paper / electronic = trees / chemicals); time wasted by not sharing (staff productivity = energy and natural resources). eliminate the build up of toxic substances – e.g. imagine the scale of schools / education institutions around the world and the waste therein; laboratory waste material; physical materials from arts classes; discarded old computers and technology; discarded old furniture and materials. degradation of local environments by campus building. meet the basic needs – including a right and access to education. There is much work to be done there. That is the topic for future research, workshops and brainstorms. I can’t possibly paint such an intricate picture on my own. I do like Robèrt’s model though, that works for me. Working toward a summary of my learning on this course. Analyse trends, issues and opportunities that will influence future activity and generations in a chosen sector. Globally, education is expanding – so this will bring the need to address all of the points above, reducing the use of precious resources and minimising waste and the environmental impact. Growth of online learning – that must be a winner, reducing the need to physically travel to campuses and institutions, but there is again an energy cost, and impact on natural resources required to build our digital capability. In the UK, certainly growth in numbers of education providers and move to bring new private providers into the market. Business and profits might not mean thinking about sustainability here. As time goes on, the repeat production of learning materials / resources / lecture slides becomes incalculable. OH NO. AND THAT IS THE END OF THE COURSE. In this session (session 3) we consider the relationship between man and the planet. This is an awesome video that provokes us to think about the impact mankind has had on Earth. I have no doubt that we hold a major responsibility for the health of our planet, and that we have been abusing, deforesting and polluting it for centuries. I’m just not entirely convinced that within the last decade man has been responsible for the directional and causal relationship between the changes in weather etc that we now see. That seems a tad arrogant to me, that man can be so mighty as to change mother nature itself. I also think that thinking in this diverts funding and activity from the really important issues – like deforestation. Remove the lungs of the world, and it is hardly surprising that CO2 levels will rise. When I was growing up there were two very harsh winters in the UK. That was good for my family because my dad was a coal merchant! The talk at the time was about entering the next ice age. I don’t quite understand how within 40 years the scientific community could entirely change its opinion regarding the climate. So overall I think, some of the arguments don’t stack up for me, but that shouldn’t dissuade us from our responsibility. Microbes were the first organisms to utilise the resources on the planets, harnessing the energy from the sun, growing, and aggregating the carbon sources. There is always the same quantity of water on earth. It is staggering to think of the millennia of recycling that has gone on. We are drinking water that dinosaurs must have drunk. In nature, sharing is everything. 70% of the oxygen comes from the algae within the oceans. Isn’t that a solution? We can’t quickly replace rain forests, but we can grow algae? The earth counts time in billions of years – it took 4 billion years to make trees. That confuses me even more when we think of the last decade and I am concerned that we are not thinking in a broad enough context or time frame. The trees are the vital lifeline – water, vegetable, mineral and matter. The formation of soil. So is that not part of a solution also? And further proof of how awesome trees are. What do we know about the bonds that link the species on earth? I agree that the earth is a miracle and a mystery. I’m worried that placing the future of it in the hands of politicians, corrupted by money and their own interests, is not going to create a healthy abundant planet for future generations. So how is current human activity changing the organisation and location of chemicals (and life) on the planet? As noted above, I’m a little concerned that we are looking within the wrong timeframe. We can learn from physiology again. We are now all familiar with the signs and symptoms of neurological disorders such as Alzheimer’s and Parkinson’s. So here are some questions. Where do you think in the body that these diseases originate? If someone develops the disorder, do you think the disease process started within the previous month, year, or twenty years? What would be a single biological marker you might measure to diagnose these diseases? What we know increasingly from scientific research – populations studies, animal studies that provide clues to mechanisms, and human clinical studies, is that these are problems that build up over a long time frame. As with heart disease or blocked arteries, these processes can begin in early life but manifest much later. Science also tells us quite clearly now that these are end-stage manifestations of processes that start in other areas of the body. The links between gut dysfunction and brain dysfunction almost appear in the scientific journals on a daily basis, and even more fascinating is the role that our body bacteria may play in these processes. We are more bacteria than human after all! But see how easy it has been for science to look in the wrong place and at the wrong time. And what about science focused on looking for a single biological marker? We now hear how people are studying the eye, looking at our sense of smell as early indicators of neurological disorders? It is a lot more complicated than we thought. So what about the planet? Again, I know I am a little sceptical of the politicians and decision makers with regards to solving our planet’s problems. I know how research funding, politically decided, can direct researchers off in set directions. Medical research works in the same way. We have to work out the impact that our research will have before we have conducted any studies these days. That should in theory be impossible. We need funding that is allocated in an unbiased manner, and that shouldn’t be linked to vested interests and career progressions for those conducting it. I do hope that to understand our natural ecosystems and its relationships with mankind, we are looking holistically, and at wider time scales. What can we learn from more controlled events such as the industrial revolution, or World War I and II? Levels of pollution you might assume to peak during these times, so what was the impact? What about volcanic eruptions? That must have a devastating effect on the atmosphere and cause clouds that disrupts access to the sun’s energy. The session today really makes you think how there is a finite amount of water, amount of chemicals and amount of energy. Everything needs to be in balance – homeostasis – otherwise things go wrong, get destroyed or die. It is like a balloon dog – if you wanted a poodle but squeeze in the wrong place you’ll end up with a dachshund. (OK wiener dog if you are in the US). With a wrong squeeze, we could redistribute valuable earth resources to the wrong place. Image by F Delventhal, Flickr, CC By 2.0. So ultimately for the planet we want the eternal conversion of stuff into more useful stuff. We don’t want it stuck as un-useful stuff. Resources that end up on the scrap heap. Too much CO2 in the atmosphere that isn’t recycled back to our trees, plants and algae. So it is important that we understand our natural biological processes – photosynthesis, and also our geological processes. Might we be moving to a new epoch? The course asks us to read this article in the Independent news paper – Anthropocene-we-might-be-about-to-move-from-the-holocene-to-a-new-epoch? I guess that makes me nervous, because all other epochs have come to an end, and so might this one? Also I’m not sure about the definition of anthropocene , first coined in the 1960s, which focuses on human activities but not our inactivities. The definition doesn’t mobilise us into action. Again it seems a tad arrogant to me that in the billenia of our wonderful planets existence, mankind should take its place on the timeline of geological epochs. It also troubles me slightly that of the working group of 13 mentioned in the article, there were two women and a distinct lack of diversity. But if having a new epoch focuses humans and lifts them from their level of inactivity, that must be a really good thing. 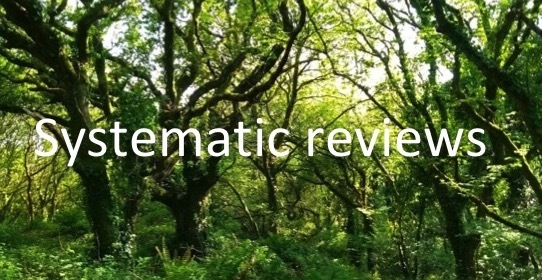 Session tasks – considering how humans have effected natural ecosystems? The never-heard of impact of nuclear testing that must surely cause massive disruption of the earth? WOW! I’ve got to link this all back to my quest of understanding EDUCATION in a more sustainable context? I guess this session has made me think about the OUTPUTS or STUFF that is ultimately valuable and is needed to be sustained. It has also made me see the difficulties in good quality / fair / unbiased / open EVALUATION and assimilation of knowledge surrounding these issues. It has made me think about the impossible POLITICAL challenge at any level, whether governmental or within an institution or group of people, that it is necessary to influence to provoke change. 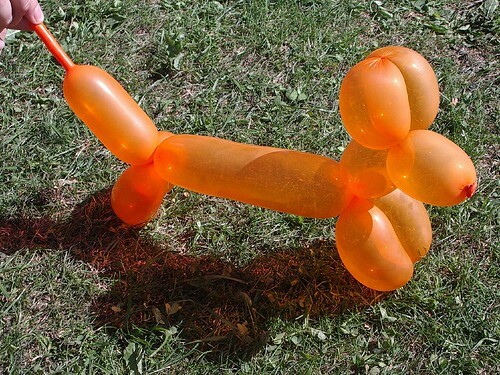 Meanwhile, let’s have another balloon dog. 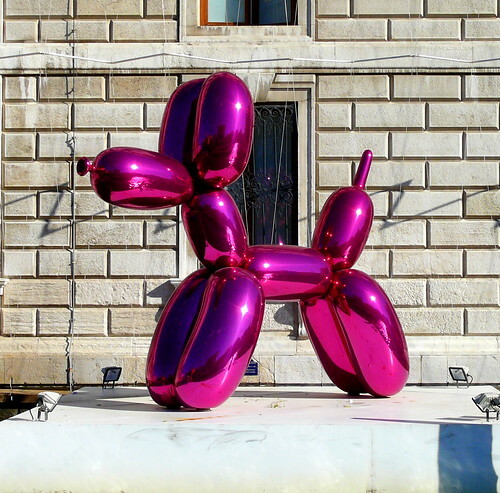 Image by Andy Wright, Balloon Dog, Flickr, CC BY 2.0. My case for transformation is that: educational institutions create knowledge and resources that are largely unshared. I could think of a second case for transformation: knowledge generated is not built-upon and is therefore re-invented. Quite right. But we have to start somewhere. I think the small things can also matter. So on with Session 2 of CSF101 which is about systems, and I might find connections between the small things and the wider context that Joss is exploring. What are the connections between tools, practices, processes and wider education? I’ve just realised that as a physiologist, I should have a pretty good idea of how systems work, and I can’t believe I haven’t made that connection before. The course says there are 8 body systems – there aren’t. There are 11 (so a bit more complicated). MIND CURLERS. Can you guess them? Homeostatic principles and feedback allow each of these systems to interplay, and if an imbalance is created (poor nutrition, lack of exercise, ill health), that is when things go out of kilter. The most remarkable display of the interrelation of the human body was being with my dad at the end of his life. The body systems were failing like dominos in a line. The urinary system was in close connection with the circulatory, and as the kidneys failed, the blood pressure declined, and so it continued until the blood pressure was no more. The miracle of life was unwinding before my eyes over a period of hours. To achieve sustainability, and to design sustainable systems, I would think we need efficient component parts communicating by efficient feedback systems. We need to avoid ‘unintended’ consequences. Of course, the world is more complicated, and we are talking about very different systems interacting – economic, social, ecological, biological. In the video Peter Senge talks about business systems and the need to avoid problems. What does it take? Learning. Being prepared to learn and admit you are wrong. 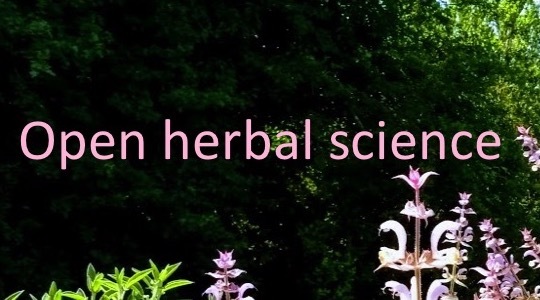 The main difference between this and our body’s homeostasis, is that our sequence of receptors and control systems, are compliant, take the evidence on board and act accordingly. “A deep and persistent approach to learning”. Also you need to triangulate “different people with different points of view to collectively see”, and these processes may take time. Different from the body here, where the physiological reaction will generally be very fast and efficient. The solutions to the problems, seem pretty well mapped out and rehearsed in the body, unlike elsewhere. I like the comments that our societies and schools are very much focused on the individual – the smart kid in the class. “The smartness we need is collective”. I do disagree that businesses are there to solve problems – we do very little to learn from what went well, and when our existing economic, ecological or whatever system works fantastically, I don’t think we do take enough opportunities to consider that. If I think about the beauty of the open education community as it exists and grows – the collective values and collective intelligence within it, is absolutely part of the success. Yes, there are individuals and maverick and rebells within the system, but ultimately they communicate back to the world through blogs and social media, and form part of the unit. The importance of a shared goal. The human body works together to keep us alive. The goal is clear. To be sustainable, we all need to define what our goals are. (From Nature article by David Griggs, Montash University Victoria Au). Such a framework has to be a useful starting point, but some of the problems that might arise come back to terminology – security seems an odd word. There will be clashes of priority – it is OK being virtuous in the West about pollution and farming methods, but this might be life and livelihood for others. Key to this is the redistribution of wealth I would think. Also this seems a very ‘corporate’ and traditional framework, which we have proven over the years that is not a very effective approach otherwise we wouldn’t be considering the problems we have surely? I’m surprised there isn’t some more innovative and creative thinking around what business and performance management approaches we should be considering? A am therefore not going to use this framework and do the challenge – but focus on the targets. These need fully understanding before any strategy can be put into place. I know from managing enough people and running appraisals, the moment you throw SMART objectives at some people and define their objectives for the coming year, they are turned right off. About 50% of people I’d say. So framework away if you must, but we need space for big hairy innovative thinking.